Bears interior offensive line vs. DL Michael Pierce – Pierce has been impressively consistent in run defense this season. He’s played 117 snaps against the run this season without missing a tackle, the second-most among all defensive linemen. His 13 total stops this season is tied for fifth-most on the defensive line, and it’s going to take a group effort from the Bears interior to slow him down. Center Cody Whitehair has a 41.9 overall grade this season, the fifth-lowest, so he might need some help from Kyle Long and Josh Sitton, who are both in the Top 20 highest-graded guards. Sitton is the only one of the three with a lower run-blocking grade (63.9) than pass-blocking grade (80.2). 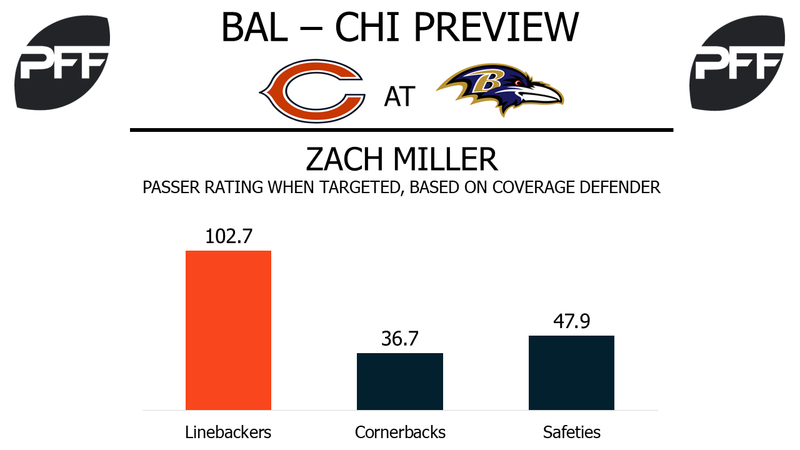 TE Zach Miller vs. LB C.J. Mosley – Miller was Mitchell Trubisky’s go-to target in his first-career start. Trubisky had four passes that took longer than four seconds to throw, and all four went to Miller when the play broke down. The tight end is the highest-graded skill player on the Bears at 77.3 overall, and he’ll have some opportunities in this game against Mosley. Of the linebacker’s 24 targets this season, 10 have come against tight ends, allowing 10 catches for 118 yards and a touchdown, a 149.2 passer rating. His total of 239 yards allowed in coverage is the second-most among inside linebackers. WR Kendall Wright vs. CB Lardarius Webb – Wright has played the most snaps of any Bears receiver this year, providing a relatively productive option out of the slot. Bears quarterbacks have a 117.4 passer rating when targeting him this season, the 15th-highest rating among wide receivers this year, and he has not dropped a pass out of the slot this season. Wright will face plenty of Webb, who has been the sixth-most targeted cornerback in the slot this season. However, quarterbacks have just a 60.2 passer rating when throwing his way, despite targeting him at an average depth of 10.8 yards down field. HB Javorius Allen vs. LB Danny Trevathan – While Allen has not been the most productive runner (39.7 run grade), he gives the Ravens a solid option out of the backfield in the passing game. Allen has run the 13th most routes (90) at his position, and has earned a receiving grade of 75.6, ranking 18th among running backs. Like Allen, Trevathan has fared better in the passing game than the run game, earning a coverage grade of 76.4 to this point compared to a run-defense grade of just 44.6. Allen is coming off a 25-touch game in Week 5 to face Trevathan, who returns this week from his one-game suspension. 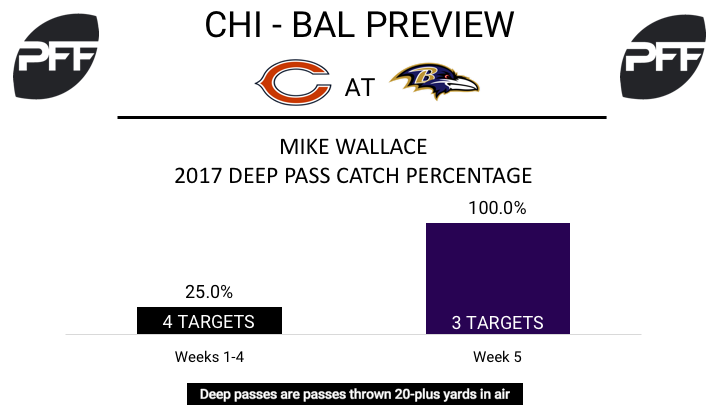 WR Mike Wallace vs. CB Prince Amukamara – Wallace is coming off his highest graded game of the season after catching three of three targets for 133 yards against the Oakland Raiders. His 83.1 game grade ranked fifth among wide receivers in Week 5, and he now has the sixth most yards on passes of 20-plus yards in the air (149 receiving yards). This week he faces Amukamara, who through three weeks has averaged 26.0 coverage snaps per reception allowed, sixth most among cornerbacks. Amukamara has also allowed just 27 yards in coverage. T Ronnie Stanley vs. DI Mitch Unrein – Stanley has been strong in run blocking this season, ranking third among all tackles in run-blocking grade (86.7). He will likely see a lot of Unrein this week, who has been one of the unsung heroes of the Bears’ front seven. The complement to Bears DI Akiem Hicks, Unrein’s run defense grade of 84.0 ranks tied for 16th among interior defenders, and his run-stop percentage of 12.9 percent ranks third among defensive tackles (minimum 40 run defense snaps).